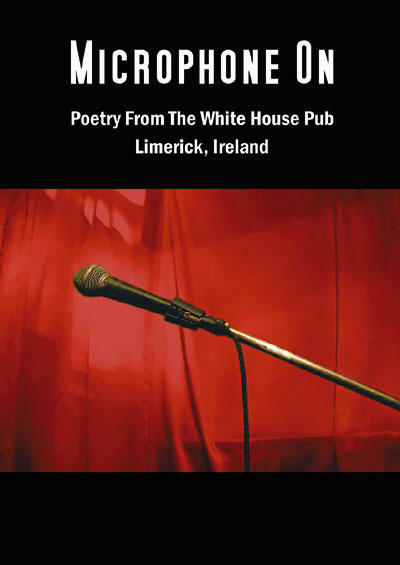 Every Wednesday night for over two years the White House Pub in Limerick has hosted an open mic session of poetry. Over the past nine months I have been designing and editing a book of these poems, with co-editors Dominic Taylor and Bertha McCullagh. Last night, Wednesday August 17th, the book was launched. The policy for inclusion was as open as the nights themselves. Any poet could submit works, and one or two poems would be accepted. 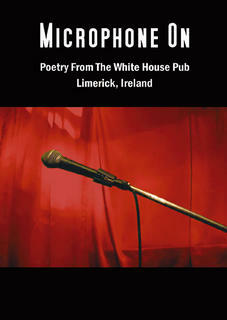 The book contains many poets published for the first time, as well as those with a long track record, both here in Ireland and abroad. The result is an uneven collection, but one which properly captures the spirit of the weekly event. I wanted the cover to reflect the open mic aspect of the evenings in a bold design that would transcend the sorts of "pretty" images usually associated with small press poetry. I believe I have succeeded and am very happy that the job is now done. Anyone who has worked on a book knows the enormous relief that follows a launch! If you search around the official web site you may eventually find a way of ordering the book. And yes, I have two poems in the volume. Good ones too! The Monday August 22nd Limerick Leader featured a masthead photo of yours truly and company. An inside article featured the kind words of the Deputy Mayor. There has also been coverage in the other city papers plus radio. Sales of the book have been brisk; there is no doubt this first printing will sell out. I will put up a notice here when it is in bookstores. A Wholesome Game YOU Can Play!